Everyone can use a break from the city, even those college professors we can’t imagine having lives outside the classroom. 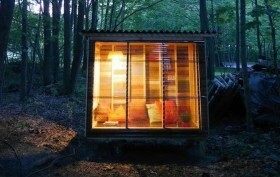 Equipped with a dream and a newly-bought plot of land in New Jersey, one NYU educator hired Derek “Deek” Diedricksen of RelaxShacks.com to build a tiny cabin perfect for grading papers and relaxation. The micro-pod was constructed on wheels and made almost entirely out of salvaged and recycled materials. The damage? Just $400! Learn more about this awesome study cabin over at Inhabitat.